So, we have meant to move both produciton servers and develoment servers accross to a virtual server platform for a while now – but time / development time has been at a minimum. Recently however I came accross this great post by – Tinkererguy on Tinkertry.com. Tinkererguy had picked out a very similar spec whitebox ESXi to my goal – a resonably priced / high-end workstation, capable of easing us across to virtualization without a large supplier bill! On several occasions I have been disappointed with the quality of whitebox cases, but workstation and server – it seems that there are “Budget” cases and “Enthusiast” cases, but nothing inbetween. The Antec Take4 is a high build quality, 4U rackmountable server case, with a fairly good airflow design. I would definately mark the case down for the inability to remove the 4x HDD trays which I would have liked to maybe replace with a better HDD backpane. Rigidity is good, and there was plenty of space for fitting 4 internal 3.5″ HDDs and my 4 bay 2.5″ HDD backpane. Individual SATA3 drives are detected, but when configured in RAID they are still displayed as individual drives. Both onboard 1Gbps LAN are detected and work fine. 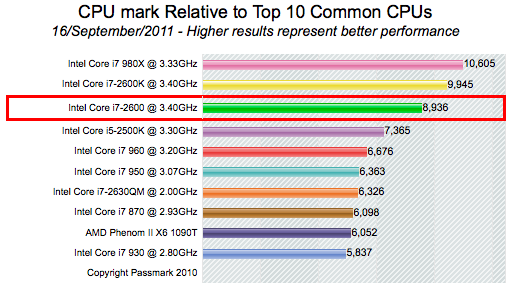 According to PassMark (link) the 2600 is the fastest mid-priced CPU, capable of VT-d with a resonable ‘oomph’ behind it! Quite simply, most of the higher end DDR3 would be suitable for this project – so I picked Corsair, a brand that I have used many times before in the past. Caviar Blue drives offer a balance of performance and reliability. The SATA3 6Gb/s interface should help give good transfer speeds for the main data store. does you config support FT. It might be worth asking Tinkertry – and his VMware blog posts helped me out a great deal. If you find out anything, it would be great to hear back.